These two page, front to back, laminated sheets summarize key definitions, theories, concepts and models from two books coauthored by Nancy Lee and Philip Kotler. They provide a quick reference guide and convenient mechanism for reviewing, reinforcing and sharing principles and practices from each of the books. 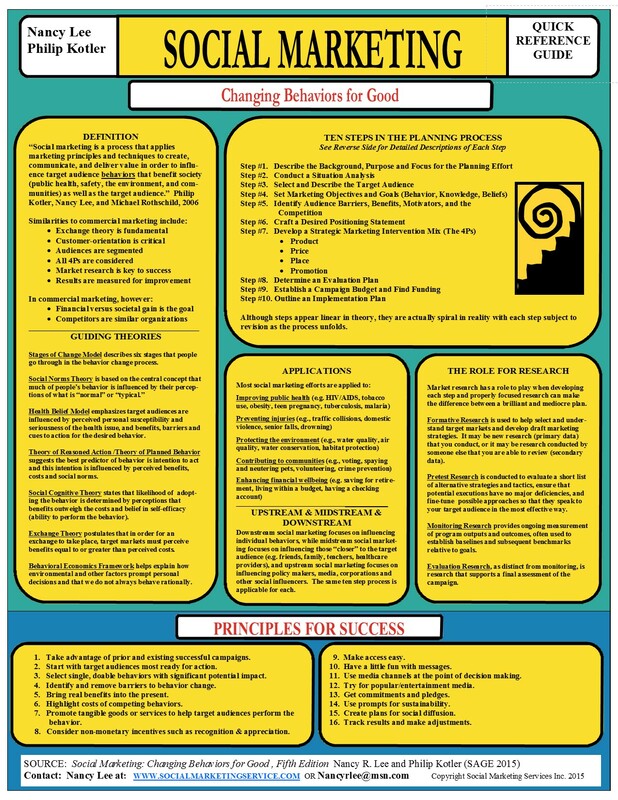 Laminated Primers are available from Nancyrlee@msn.com for $5 each including mailing; or you can download and print from: Social Marketing in the Public Sector, Social Marketing, Influencing Behaviors for Good Edition 4, Social Marketing, Changing Behaviors for Good Edition 5. Social Marketing - or- Marketing in the Public Sector primer and number of copies. Orders will be mailed with an invoice for payment.